The GE OEC 9800 C-Arm is designed to last longer via a rotating anode, its patented battery buffer technology, and its high-quality locks, levers, and controls. 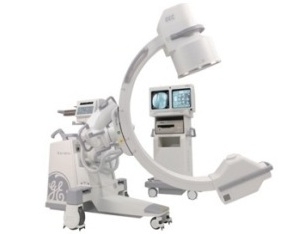 Then, when taking images, GE OEC 9800 C-Arm provides point-of-shoot ease with its SmartView pivot joint. This versatility has made the 9800 a popular choice in the ER, OR, or pain management clinic.